Are you looking to accelerate your hybrid cloud journey for secondary data and apps? And unable to do so with traditional solutions not built for the cloud? By 2020, companies are expected to run 83% of their workloads in the cloud. And the exponential data growth will create management challenges, overwhelm IT resources, and drive enterprises to seek out innovative solutions. 63% of enterprises are managing 50 PB or more with 40-50% annual growth. 51% of businesses admit their backup infrastructure can't keep up. 79% of IT decision makers are likely to move some legacy tape data to the cloud. Imagine one platform where you can manage your secondary data and apps, including long-term retention, disaster recovery, test/dev and cloud-native backup. Hybrid cloud is increasingly the norm, and enterprises are challenged with ways to have visibility, manage and make use of all this data – both on-premises and in the cloud. 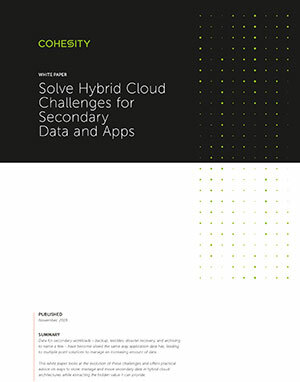 This white paper looks at the evolution of these challenges and offers practical advice on ways to store, manage and move secondary data in hybrid cloud architectures. This video provides an overview of Cohesity's cloud solutions for long-term retention, how customers can overcome challenges associated with legacy solutions and reduce their reliance on tape. The video also touches on the ability to leverage backups on the Cohesity platform for test/dev in the cloud. IT challenges have evolved as enterprises experience digital transformation and evolve in a hybrid cloud environment. Get more details on those challenges and how you can think about reducing management burden and extract more value from data, regardless of where they reside. By 2020, the number of enterprises using public cloud as their data center backup destination will double to 20%. As a global technology solutions provider, we like to stay ahead of the technology curve. We saw clear value in adopting Cohesity to consolidate and simplify our secondary storage infrastructure. 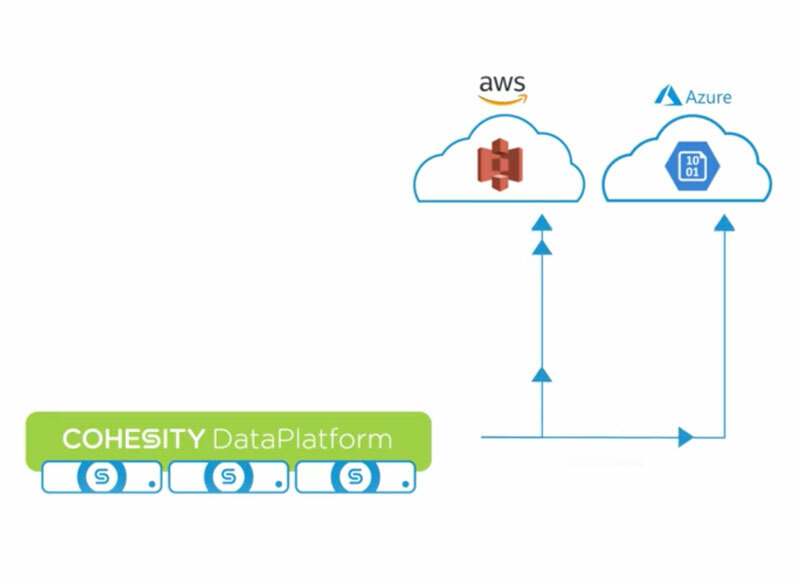 Cohesity allows us to consolidate data protection and file storage, while providing simple integration with the AWS cloud for long-term archival.